Watercolour has a long tradition in many cultures around the world. It is considered as the oldest painting medium… in Art history. Primitive humans applied water-based pigments with fingers, sticks and whatever was naturally available; their works can be seen in prehistoric cave paintings. These paintings were sometimes drawn with ash, earth/minerals and water. The Far East has many surviving pieces in which the painters incorporated lettering and story telling in most of the works. Egyptians used water based paints to letter and paint on papyrus paper, as well as decorate tombs and public spaces. The ancient Chinese also have a grand tradition of watercolor painted on silk ( started around 200 BC) and later on hand-made rice papers; the Japanese soon followed their lead. The Chinese and Japanese production of masterpieces grew suddenly with the advent of hand-made papers around 100 A.D. The Moors brought papermaking to Spain in the 12th century which soon spread to Italy. Two of the oldest paper manufacturers include Fabriano of Italy which opened in 1276 and Arches of France, which opened in 1492. During the Middle Ages, European monks used water-based paints to create elaborately decorated books. These works are considered to be a major art form and were painted on vellum or sheepskin. “The Book of Hours” circa 1415, is considered to be the most famous illuminated book. Medieval and Renaissance artists painted frescos with water-based pigments on wet plaster, the most recognizable being Michelangelo’s Sistine Chapel completed in 1512. Albrecht Dürer (German 1471 – 1528) was the first acknowledged master of watercolor. He used complete renderings in the medium as studies for other works; these studies now stand alone as great works of art. Hans Bol (1534-1593) created the first school of watercolor and was heavily influenced by Dürer. Peter Paul Rubens (1577-1640), known for his voluptuous figures, was also a master watercolorist. From the 18th century on British dominated water-colour scene. In the early 19th century, American masters like Winslow Homer, James Whistler, John Singer Sargent and Thomas Eakins created works on par with, or greater than the Europeans. LaFarge, also of stained glass fame, was a preeminent watercolorist. Homer, Sargent and Whistler exceeded the confines of English watercolorists’ works. American born Impressionist Mary Cassatt, famous for her depictions of domestic life, also took an active interest in watercolors. French painters Honoré Daumier and Eugene Delacroix are also well known for their remarkable creations in watercolor, Daumier for his satirical political and social works. In 1866, the world's finest watercolor paint brushes No 7 were originally made for Queen Victoria by Royal Warrant. British Royal interest in water-colour art lasts until today.https://www.royalcollection.org.uk/exhibitions/royal-paintbox-royal-artists-past-and-present , 350 years with a collection of 40,000 watercolour paintings. By the late 19th century, 1870s onward, artists’ societies promoted watercolor, successfully bringing the medium into mainstream America. The American Watercolor Movement of this period paved the way for later watercolorists to be seriously received in exhibition with artists painting in other media. Early 20th century, American artists of great renown Georgia O’Keefe, Arthur Dove, and German artist Paul Klee, and Russian born French painter Vassily (Wassily) Kandinsky were painters who found voice in watercolor painting. The American artists and their contemporaries embraced watercolor as a primary vehicle, equal to painting in oils. This also became common with major English painters. American artist Mark Rothko (1903-1970) created large canvases with transparent water-based paints which created an atmospheric feel to his works. Additionally Edward Hopper and Charles Burchfield were notable contributors to the medium… and another significant contributor, John Marin, was a proponent of watercolor, the majority of his works being in the medium. Unlike the large paintings of Abstract Expressionists, watercolors were usually created in a smaller, more intimate format. American artists contribution to the watercolor is second to none. They continued to work in watercolors, which lost then gained enormously in popularity with a wide range of creations, continuing the tradition with new and innovative results. Artists Philip Pearlstein, Francesco Clemente and Andrew Wyeth worked in watercolors even during its short lived decline in the Americas. Currently the U.S. dominates the international watercolor scene. The popularity of water-colour continue into 21st century with a long list of Watercolour Societies around the globe, UK, USA, Canada, Europe, Australasia and Asia. From an opaque look on the cave walls, artists have driven the development of watercolour material, techniques, and expression toward more strength, permanency, transparence, illusiveness, luminosity and effortless poetry... To emphasise the importance of these attributes, watercolour purists (a concept developed by British artists) go as far as eliminating the use of Chinese white in their works because of its opacity. Others emphasise on the versatility in mix media art. Evolution of watercolour is a long journey since the early days of human civilisation. In 2011, a 100,000-year-old human-made ochre-based mixture that could have been used like paint was found in South Africa. We also have cave paintings drawn with red or yellow ochre, hematite, manganese oxide that may have been made by early Homo sapiens about 40,000 years ago (source: Wiki). Watercolour art has evolved from primitive basic to the sophistication along with development of science , technology and social history. 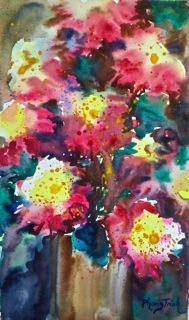 The diversity and dynamic of watercolour art that we enjoy today is the result of global efforts. It symbolises the art of unity without boundaries!